The two-year MEPI-sponsored Young Women Leaders program comes to an end with a series of events to celebrate its accomplishments. 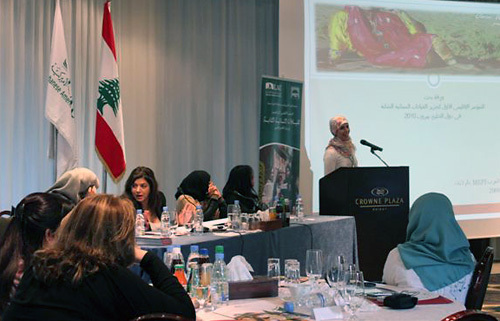 Attendees from throughout the Middle East participate in the YWL program's First Regional Conference on Advancing Young Women Leaders in the Arab Gulf States, held November 28–30, at the Crowne Plaza hotel in Beirut. Participants and organizers of the Young Women Leaders program during the November 30 closing ceremony, at LAU Beirut. In addition to the YWL participants, speakers were invited from Iraq, Tunisia, Egypt and other Arab countries to the conference to talk about women breaking barriers in business, education and other traditionally male-dominated arenas. Certificates were distributed to the YWL program participants during the closing ceremony. 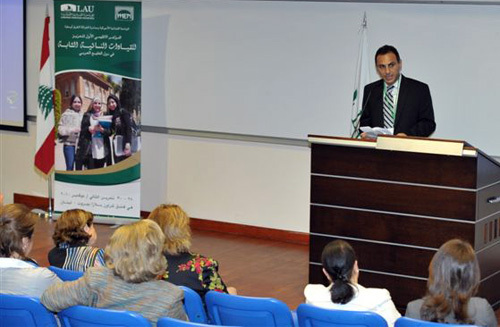 Dr. Imad Salamey, YWL program director and assistant professor of political science at LAU, speaking during the closing ceremony about the achievements of the program participants. Dr. Nabelah Haraty (standing, right), YWL program coordinator and lecturer of speech communication and English at LAU, during the Traveling Road Showcase meeting in Yemen, in late September. 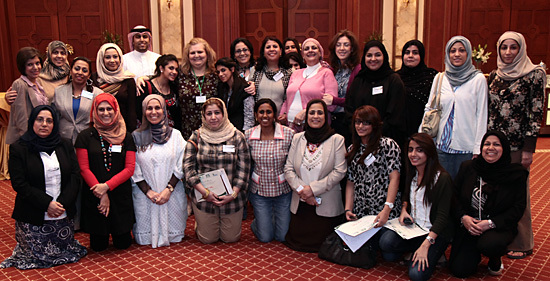 A group photo of the participants of the Traveling Road Showcase event in Bahrain, in early December. Click on any photo above to view all seven images. For those who were involved, it seemed like just the other day LAU was preparing to welcome the 20 participants chosen for the Young Women Leaders program, as they were arriving to Beirut from four Gulf countries over the summer of 2009. They underwent two weeks of rigorous leadership training at LAU, returned to their countries to put their new skills into action, and gathered at LAU once again last month, but this time to share their stories of struggle and success, and pay their farewells. The closing ceremony, which was attended by a number of ambassadors and cultural attachés representing various Arab countries, wrapped up the YWL program’s First Regional Conference on Advancing Young Women Leaders in the Arab Gulf States, held from November 28-30, at the Crowne Plaza hotel in Beirut. During the three-day gathering, the women participated in workshops and gave presentations on topics related to their initiatives in their communities. 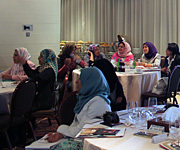 The idea behind the YWL program, which was supported by the U.S. government’s Middle East Partnership Initiative, was to advance the role of women in Gulf states by training individuals with leadership potential from Saudi Arabia, Bahrain, Yemen and Oman, then sending them back to their respective countries where they would pool their efforts to fight for a cause. 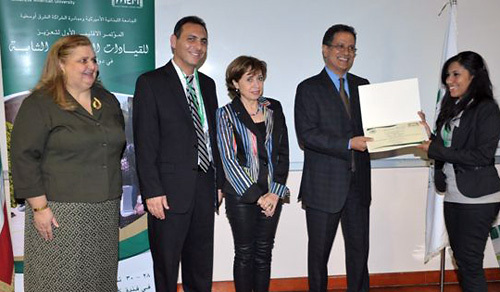 LAU was awarded a $500,000 MEPI grant in September 2008 to make the plan happen before assembling a team to run the program. Organizers had been closely monitoring the progress of the teams, since their return to their countries from LAU last summer. The Yemeni group took on a project to discourage parents from pulling their daughters out of school in a country that witnesses alarming student dropout rates. It succeeded in establishing councils in schools, which led to a significant, countrywide decrease in girls’ dropouts. The Bahrain team initiated a campaign to secure women’s right to determine the heirs of their pension funds that are currently determined by their husbands and fathers. Dozens stood behind the campaign, including lawmakers, journalists and other legal experts who helped pave the way for a draft law specifying the right. The Saudi group, which faced some restrictions as their government maintains a ban on NGOs, originally agreed to launch a website. But later it decided to hold interactive workshops and produce materials for women on how to start small businesses. It even created a manual on the subject, which was later adopted by the Jeddah Chamber of Commerce.